Sometimes, things don't do what they say on the tin, but that's no bad thing. 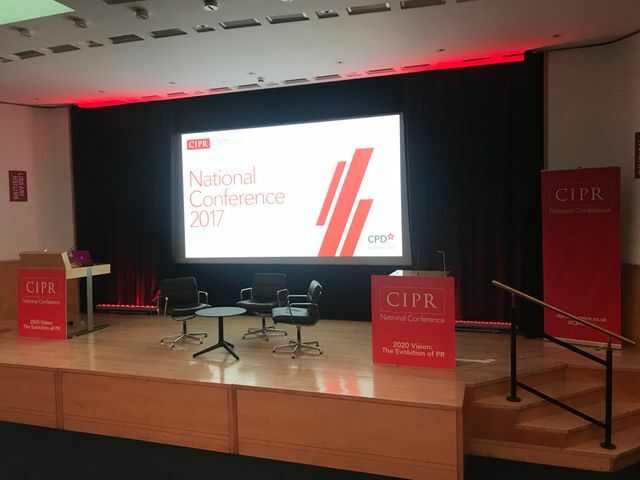 "The Evolution of PR" was how yesterday's CIPR National Conference was billed. Far from being an esoteric gaze into a crystal ball or navel, as the title may have suggested, it was actually an invigorating masterclass in corporate purpose and social responsibility. Vodafone's Group Director of Corporate Affairs Matt Peacock set the tone for the day. He gave an authoritative overview of Vodafone's approach to sustainability and corporate social responsibility (CSR). He gave a run through of the sustainability key goals and areas of focus for Vodafone, including Women's empowerment through providing access to mobile technology to 50m women in emerging markets, and the mobile operator's aim to decarbonise by 2025. Matt Peacock stated that traditional approaches to CSR were 'green washing'; merely applying a surface coat of sustainability credentials to corporations. At Vodafone, every sustainability business goal is owned by a business P&L owner, thereby embedded responsibility for their deliver into the business. Next up was Everton's Head of Engagement Scott Mcleod, who talked about the vital contribution made by the football club to the local community. He cited Everton in the Community, it's award winning charity, and the work that it has done with the local community. Again, this community work is not 'green washing' Everton's reputation. Example after example of tangible benefit given to the local community, and positive impact on fan's views of the club were given. This is important as Everton is a global sports franchise now, part of the worlds biggest sports franchise - the English Premier League - with over 1.3bn viewers globally each month. Everton can leverage it's local work to have an impact on its global perception. Kerry Thorpe, Ben & Jerry's Lead for European Communications gave us the inside scoop (excuse the pun, like their Phish food ice cream, I couldn't resist). At Ben & Jerry's they have an advisory board made up of NGOs and activists that needs to be satisfied that the company, since its sale to Unilever, continue to make good on its contribution to the community. They put corporate purpose through it's business, in the same way it puts delicious gobs of cookie dough through it's ice cream! An unlikely example of corporate purpose at work was given by Peter Heneghan of LadBible. I have to admit, I am a follower of LadBible, and I am aware of their memes and the Lethal Bizzle / Judi Dench video he showed. What I was less familiar with was their belief that; "with social power comes social responsibility". With over 1bn in reach each month, LadBible clearly has social power. What's is doing with this is addressing major social issues. Peter Heneghan showed it's 'Trash Isles' video, where they are using their platform to raise awareness that there is enough floating single-use plastic in the sea to fill an area the size of France. LadBible has declared this the 'Trash Isle' and signed up 100,000 people, including Al Gore, to be honorary citizens of the Trash Isle. So, while I was expecting to get an overview of the future of PR, what I got instead was something of a masterclass in the latest thinking on corporate social responsibility, from a range of businesses with global brand awareness and recognition. Hats off to the CIPR for organising such a great conference. It might not have did what it said on the tin, but it was first class fare nonetheless! Our products and services play a central role in the daily lives and livelihoods of more than half a billion people across 26 countries, bringing about a revolution in access to education, healthcare and financial services. Our approach to sustainable business ensures we are committed to aligning our business goals with societal benefits in order for our work to deliver positive social outcomes, not just commercial and financial success. Thank you to @CIPR_UK for #CIPRConf17. Great range of speakers. Something to learn from them all. Be true to yourself and your audiences. Thoroughly enjoyed #CIPRConf17 great work @CIPR_UK w/fantastic set of speakers. Great 2 catch up w/familiar faces & meet some new ones! Here here - a fantastic day! Thanks Claire, I hope you found it interesting and, hopefully, of some use.